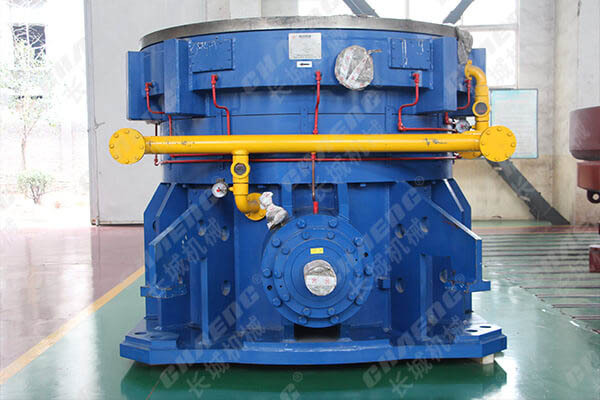 In the vertical roller mill, the reducer is called the “heart” of the vertical mill. The advanced reducer design can not only provide the load of the vertical mill, but also provide the output and service life of the mill, thus achieving energy saving and emission reduction. effect. However, due to the long running time of the vertical mill and the large wear, the reducer will have some faults during operation. If it is not processed in time, it will affect the normal operation of the mill. 1. The temperature of each temperature measuring point of the reducer is within the normal range, and the heat balance is reached. 2. The oil pressure is normal, and the records are within the normal range, and there is no large fluctuation. 3. No oil leakage or water leakage, no abnormal noise during operation, and no alarm signal for each alarm switch. 4. The interlocking device is in good condition. If there is a fault, it can automatically stop and alarm in time. 5. There is no metal shavings in the double filter and magnetic filter. 1. Regularly check whether the base of the reducer of the vertical mill, the seals, the drive shaft, etc. are normal. 2. If it is used normally, always check the oil level of the lubricating oil (can be observed through the oil window), the high temperature of the lubricating oil should be less than 85 °C. When the oil temperature rises abnormally, abnormal noise is generated, etc., it is necessary to stop the inspection immediately and remove the fault before continuing to use. 3. Replacement of new parts must be officially used after running and load testing. 4. Do not gravity hammer the outer casing of the vertical mill to avoid damage.